Support for refugees and asylum-seekers in the UK. When I arrived at Stanford for my Harkness Fellowship, several of us were hosted by academic or campus families while we found our feet and, most importantly, bought a car. It was clear the host families enjoyed having these odd, British young people foisted on them, and some remained firm friends afterwards. When the Kinder-transport children arrived, a generation earlier, my grandparents took one in and my brother’s mother-in-law was one. So I know hosting a stranger is something that any open-minded person, with some space, can do for someone who needs it; it’s not hard and it can make a HUGE difference. Over three years ago, amidst the concern about refugees fleeing war-zones and persecution, which reached its apogee with the photo of little Aylan Kurdi on that Greek beach, I co-founded a hosting charity to offer rooms to refugees and asylum-seekers in the UK. The question of what to do about refugees fleeing to our shores faces both the USA and the UK. Both governments tend to conflate and confuse asylum-seekers with economic migrants and to assume those claiming asylum are most likely lying. This gives rise to the “hostile environment” in the UK and wrenching children away from their parents in the USA. Neither is a humane way forward. 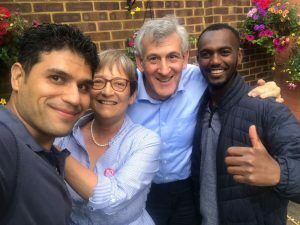 In fact far fewer asylum-seekers arrived in the UK last year than they did at the turn of the century (27,000 in the year to June 2018 against 80,000 in the year to June 2000), but the waiting time for a grant of refugee status and safety has increased. There is supposed to be a first decision within six months. In my experience – via that of the hundreds of guests we host – it seldom happened even for Syrians – for whom it is most likely – and almost never for any other nationality. In the meantime or after a refusal, and awaiting appeal, many asylum-seekers are truly destitute and have nowhere to live. Of course they are not allowed to work while they wait. Lots of our guests are in that situation. Even more have recently attained refugee status. This means the Home Office has acknowledged they have a well-founded fear of war or persecution: the definition of a refugee. For the individual, that is great news. But it also means they will be evicted from asylum-seeker accommodation (for not being asylum-seekers) just 28 days later. That’s just not long enough to sort a bank account, a job or benefits, ESOL lessons where required and somewhere to live. Thus, according to the Refugee Council, 81% of recent refugees are destitute. They just need some time to sort out debts, save for deposit, find a job and a home. And that’s nigh on impossible if you are sleeping in a graveyard, in a park or on the night bus. 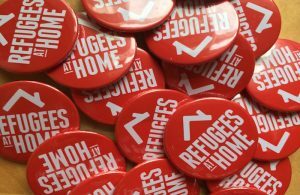 So Refugees At Home steps in and provides a temporary shelter in a spare room, usually in London or another city from Brighton and Cardiff to Manchester and Sheffield. Our asylum-seeker guests are all referred by agencies such as the Red Cross, Refugee Council, St Mungo’s and the immigration solicitors. We take up references on everyone. That’s why we host! I have welcomed 15 young men into my home in the last couple of years. They are from Syria, Sudan, Libya, Afghanistan, Iran, Eritrea, Nigeria Somalia and Pakistan. Some stayed a night or two, a week or so, others longer. So far the maximum was one of the Syrians who stayed with us for nine months. Hosting aligns with the Harkness philosophy of response to public policy, care and cultural exchange so well that I rather hope other fellows might join Christina, Malcolm and I in offering a spare room, temporarily to someone who really needs it to get over the humps in the road of life.